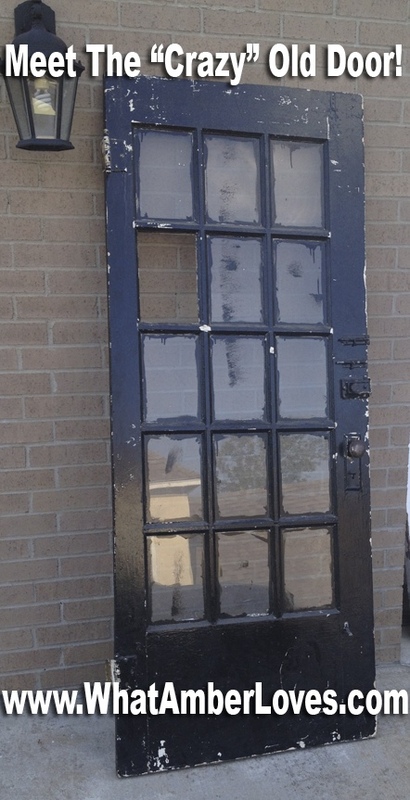 We bought a door, a really, really old door, from an architectural salvage booth at a thrift market, here in Little Rock. The door reminds me of my old, historic house that we sold. In that house, I loved adding really modern elements into the turn of the century home, because I loved the contrast. I still love contrast, so now I find myself adding historic pieces to our much newer (built in ’04-’05) modern house decor in order to achieve the contrast. This crazy old door is my newest addition to help provide the contrast that I love so much. You may notice that it is covered in glossy black enamel paint, over layers of white glossy enamel, over black, over black, etc. The paint, in general, is really well adhered, so I gave it a good old-fashioned scrubbing with a sponge and soapy water. I considered scraping the black-paint-gone-wild drips, runs, and roller marks from the glass panes, but ultimately decided that I like the character it adds to this old door. Furthermore, I decided not to replace the one missing pane of glass. Inexpensive, modern glass just wouldn’t look right beside the wavy panes with all of their wonderful ripples that show the age of the glass in the other panes. We are not using it as a functional door; we decided to hang it on the wall as a decorative art piece in our master bedroom. In order to have it “fit” the room and be a little bit more than just a door hanging on a wall, we made a few changes. First, we trimmed it top and bottom on the table saw in order to make it fit its intended space. By the way, when trimming it, we discovered that it is a cedar door! Score!! Then, we decoupaged it with scrapbook paper and ModPodge. When I say “we decoupaged” it, what I actually mean to say is that my middle daughter, age 7, did all the work! She loves crafts and was more than eager to volunteer for the project! She did the work by our back door in the kitchen, and I just supervised while I was cooking dinner. Okay, here is the part where the door is no longer “crazy,” and I become the “crazy” one. Do you notice how much wood is at the base of the door compared to the top? Here comes my crazy: Just as much as I love contrast, I also have this strong gravitation/desire for symmetry. This door is going to hang sideways. It can’t look too busy at one end and as if it is lacking something at the other end. I NEED for it to feel balanced. 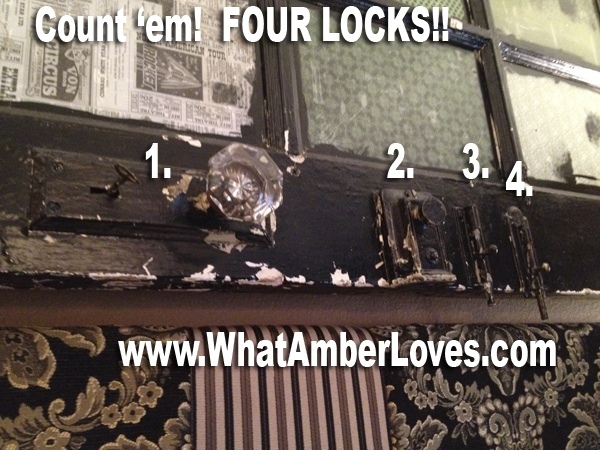 So, since the ModPodge is gloss, I decided to “fake” three panes at the bottom of the door!! Look at the photo above this paragraph; see the three “panes” with wet whitish-looking glue on the papers. Yep, we inked the edged of the paper with an ink pad intended for stamping, measured proper gaps, and ModPodge’d those papers right onto the wood in order to give the illusion of three more panes!! Fortunately, ModPodge dries really clear and glossy! The desire for symmetry was important enough to me that I did actually create FAKE panes in order to have visual balance. See, told you, “crazy”, right? Regardless, I love the way it turned out! It’s just another layer of interest on this art piece, I hope! We love it! We think it adds just the right amount of character, sense of history, and coordination with other pieces in our room. What do you think? 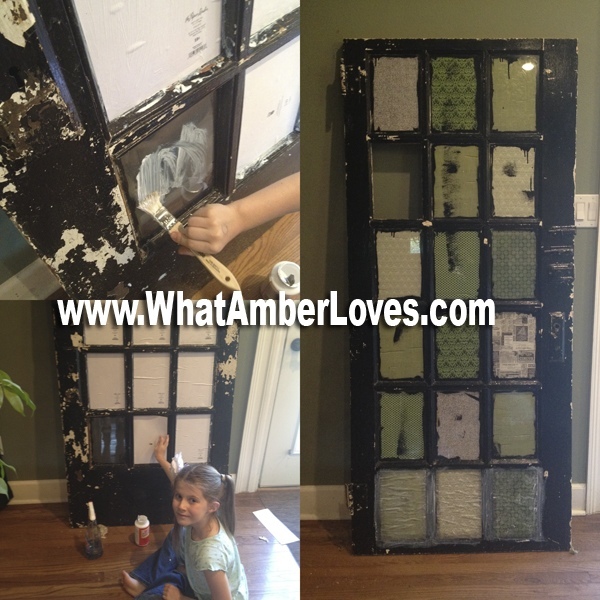 Want to see a few more neat projects using repurposed/upcycled doors & windows? Easy, click over to Dishfunctional Design’s project round-up posts here and here. Each of the photos she shows has a text link below the photo for even more info, some of which may be story/tutorial style similar to this post! My next post will show our master bedroom in it’s entirety. I already took the pictures! I think we have accumulated and created some neat pieces in our room. Stay tuned to see the rest of the room! 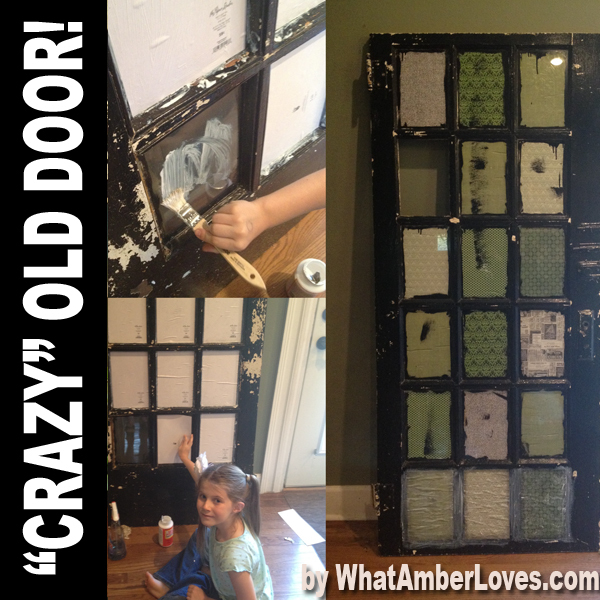 Posted on September 12, 2012, in Uncategorized and tagged antique door, crazy door, decoupage door, mod podge door, Repurposed door, repurposing doors. Bookmark the permalink. 20 Comments. In the photos I can’t even tell the bottom three panes are faked. Nice job Little 7 year old, you should rent her out. it looks amazing! i love the black distressed finish! What a beautiful piece of new old artwork for your bedroom–I love it! Your 7-year old did an outstanding job! I’m glad that you left it with all it’s age and patina in place, because I think it looks cool. What a cool idea! I love old pieces- we used to live in an old farm house and now live in a newer one. I really miss the character of the old place! 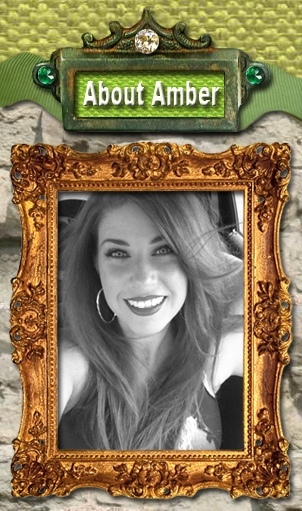 Looks fabulous there – great job!!! now you’re crazy old door is a cool decor door. Love it. 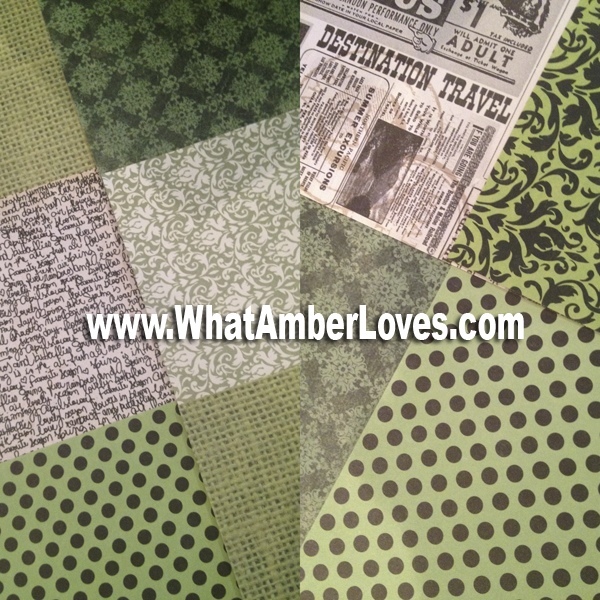 Love it, Amber! I always appreciate the inspiration you share at Potpourri Friday! What a great idea! I love the colors that you chose! Absolutely perfect! LOVE it!! This is similar to an old door I redid this weekend!! 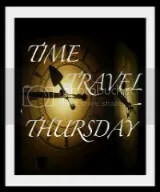 Check it out at http://www.therusticpig.com! I cut off the extra wood on mine too! Gotta love symmetry! Question… How in the world did you hang it? We used drywall anchors and everything, and it tore through the drywall! Ugh!! You are brave to have it about your bed! Eeek!! That door is crazy wonderful now! Love what you did with this door! Love it so much I’m featuring it on the All Star Block Party today!! Head on over to grab your button.